Ryan Zinke isn’t the first Interior secretary to attract controversy. Historians have dubbed it the “department of everything else,” a genuinely apt metaphor for the U.S. Department of the Interior. Not only does it draw together the diverse portfolios of the National Park Service; the bureaus of Indian Affairs, Land Management and Reclamation, and all sorts of mineral programs, Interior has been a hodgepodge of controversy throughout its long history. The current Interior secretary, Ryan Zinke, is caught in a whirl of ethical questions. He is being investigated over questionable expenditures, from private helicopter jaunts to commemorative coins bearing his name, and he is facing broad criticism for an opaque and apparently one-sided review of national monuments. But how far from the norm is Zinke’s behavior? Not far, in fact, as the history of the department shows. The relationship between the department and the West goes back to 1849, when Interior joined the federal apparatus as a Cabinet-level department to administer land, tribes and more. The West’s value rested in its real estate, and Interior’s involvement in the business of land encouraged rampant fraud. By the early 20th century, the federal conservation program emerged with new agencies and laws designed to manage resources with greater care and professionalism — and with less waste and fraud. Yet Interior Secretary Albert B. Fall continued the department’s pernicious tendency for self-aggrandizement. A senator from New Mexico with experience in mining and agriculture, Fall became secretary in 1921, part of the decade’s dominant Republican ascendancy. He was appointed by President Warren G. Harding, to whom he was a loyal friend (a quality certain presidents find more important than competence or experience). Fall detested conservation, favored full resources development, undermined tribal sovereignty, and aimed to consolidate power under him. Albert B. 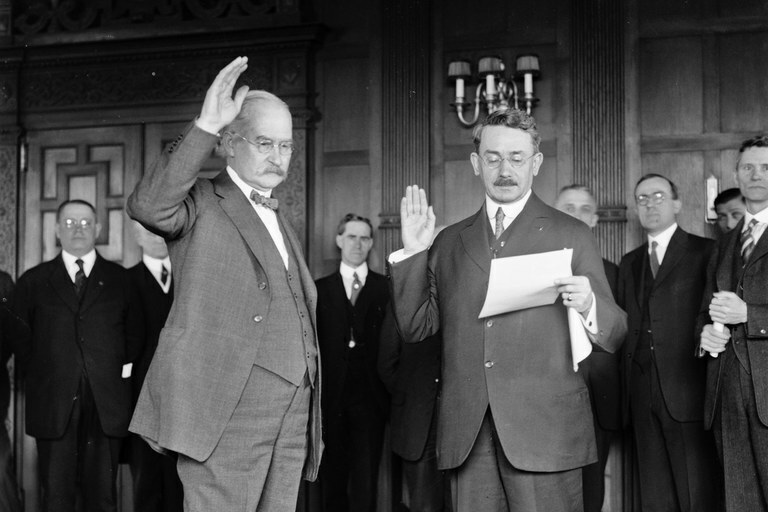 Fall swears in as Interior Secretary in 1921. Fall leased out the national coal and petroleum reserves at Wyoming’s Teapot Dome and two sites in California to Mammoth Oil Company and Pan American Petroleum Company in deals that emerged from secrecy and non-competitive bidding, a shady process all too characteristic in a scandal-prone administration. The “gifts and loans” he received from oil executives amounted to more than $6.5 million in today’s dollars. Fall came under investigation and resigned his position in 1923, was convicted of a felony in 1929, and became the first U.S. Cabinet official to be imprisoned, in 1931. For Westerners and environmentalists of the late 20th century, James Watt was the bugbear against whom all other Interior secretaries, including Zinke, will be measured. A true believer who once characterized his work at Interior as a “crusade,” Watt represented multiple prongs of then-President Ronald Reagan’s new brand of conservatism: anti-government, pro-industry and evangelical. 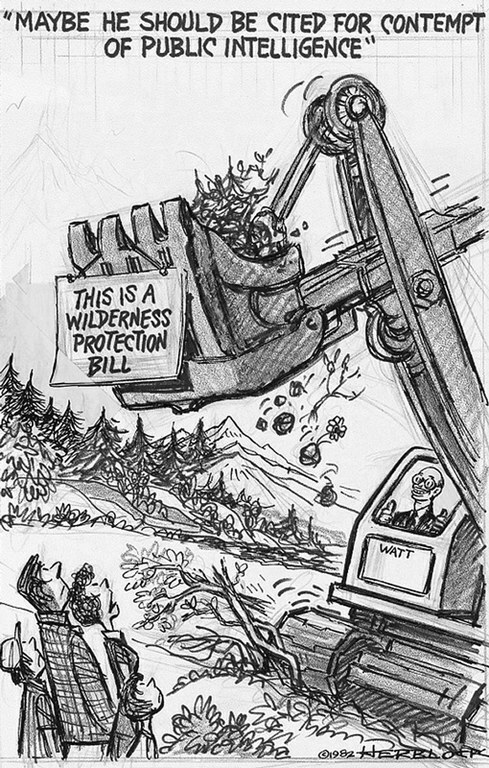 Watt’s conservative bona fides aligned him with the emerging Sagebrush Rebellion, which aimed its ire at federal environmental regulation. That association that made Watt a prominent lightning rod for the Reagan administration’s contempt for environmental protection. Like Fall, Watt envisioned Interior primarily as a developer of mineral and energy resources, and he sought to limit wilderness and recreation. In 1982, Watt proposed selling federal lands directly to citizens, an idea incompatible with existing legislation. Watt’s greatest legacy, though, was to galvanize American environmentalists; both The Wilderness Society and the Sierra Club roughly doubled in members during the Sagebrush Rebellion. Eventually, Watt’s gaffes caused his downfall, particularly his tone-deaf boast, in 1983, that an Interior advisory committee included “a black … a woman, two Jews, and a cripple. And we have talent.” Watt soon resigned, a political liability to the Reagan Revolution.